The following first look is a portion of our full Beretta APX Carry review from the upcoming special “Concealed Carry Handguns” issue of Personal Defense World magazine, on sale May 7, 2019. Grab your digital and print subscriptions at OutdoorGroupStore.com. Watch the video above for an in-depth look at the new pistol. Despite a constant stream of mainstream news headlines decrying gun ownership, more citizens are carrying firearms now than ever before. Last year, the Crime Prevention Research Center reported that concealed carry permits had grown to more than 17.25 million. That figure marked a jump of nearly 900,000 in 2018 alone. From 2007 to 2018, carry permits grew by nearly 13 million, an astounding increase, according to John Lott, who founded the center. Meanwhile, bullet technology and terminal ballistics in factory loadings marketed for self-defense have rewritten the rules on what a proper carry gun looks like. While the .45 ACP was once the unquestioned king, more diminutive calibers are seemingly finding new life. The result is an ever-growing stable of subcompact pistols. 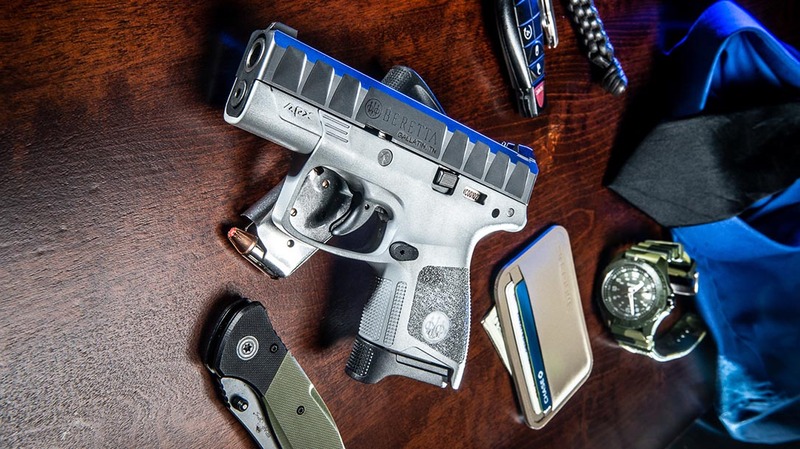 Beretta’s newest entry into this crowded field is the APX Carry. There’s a lot to like about the Beretta APX Carry, but the most impressive attribute, one that combines real-world thought with engineering and execution, is the trigger. As much as any part of this pistol, it was designed with a purpose. The trigger pull jumped out immediately upon dry firing and again on the range. It’s a longer pull than many might be used to. But it’s pretty smooth and extremely deceptive in its weight. I estimate the pull weight to be around 6 pounds—a figure echoed by two different gunsmiths at my local gun shop, interestingly enough. But the pull weight averaged 8.5 pounds on a Lyman digital trigger pull gauge. During testing, that deliberate pull ended up being much of my focus. It’s so well done that I was shocked how well I was able to shoot with an 8.5-pound trigger. No, it’s not quite as stellar as an old Smith & Wesson revolver, but then again, what is? But when I performed some “dot drills” to measure the APX Carry’s accuracy, I created literally dozens of 1- to 2-inch groups off-hand at 7 yards. The bigger impediment to true precision shooting are more likely the steel sights, not the trigger. And that’s in no way a criticism of Beretta’s choice here—just an acknowledgement of the system’s eventual limitations. For carry, it’s not about hitting 10 rings, and the white-dot front sight and serrated rear notch deliver a solid targeting system. I found my limits while aiming at small dots, as the sights eventually cover far-away targets. However, during fast acquisition drills, hammer pairs and “2/1” drills, the sights pick up quickly, and the entire pistol points easily. Running the trigger hard, I found I would need greater training to correct a tendency to shoot a tad low. And that was going about as fast as I could go, running the pistol at my edge of skill. But the long trigger pull takes some getting used to as well. When I pushed my limits, I pulled shots low. When I slowed down, my hits were dead on. Now that’s true with anything, but it’s relevant here because shooters will likely benefit from more time and training with the APX Carry’s trigger. On the range, the extended eight-round magazine was an absolute pleasure, as it provided a full grip on the pistol. But the six-round, semi-flush model proved highly controllable as well, allowing me to get just enough of my pinky on the gun for adequate control. Running the pistol through drills that required reloading, I really liked both mags. Beretta includes both with the pistol as well as a fully flush baseplate. Beretta needed the APX line to compete with Glock, Smith & Wesson, SIG Sauer and other makers on the market. And the company, in my opinion, hit a home run with what has now become a full line of polymer-framed, striker-fired pistols, including the full-sized, Centurion, Compact and Carry variants. But rather than merely being a shrunken version of its predecessors, the Beretta APX Carry instead benefits from a tremendous amount of thoughtfulness and design. And though it wades into what has become a deep pool of competition in the subcompact semi-auto pistol market, the APX Carry should fare well. This is a new kind of Beretta, and once folks get it in their hands and shoot it, many will walk away with a new carry gun. For more information, visit Beretta.com. Bullet weight measured in grains and accuracy in inches for best five-shot groups at 7 yards.